the men, often defending their very doorsteps. Drawing upon personal correspondence, private journals, and even favoured recipes, Roberts reveals the often surprising stories of these fascinating women, bringing to life the everyday trials and extraordinary triumphs of individuals like Abigail Adams, Mercy Otis Warren, Deborah Read Franklin, Eliza Pinckney, Catherine Littlefield Green, Esther DeBerdt Reed and Martha Washington-proving that without our exemplary women, the new country might have never survived. ambassador and long-time Democratic Congresswoman from Louisiana Lindy Boggs and of the late Hale Boggs, also a Democratic Congressman from Louisiana who was Majority Leader of the House of Representatives and a member of the Warren Commission. Roberts graduated from Wellesley College in 1964, where she received a BA in Political Science. Roberts has won numerous awards, such as the Edward R. Murrow Award, the Everett McKinley Dirksen Award for coverage of Congress and a 1991 Emmy Award for her contribution to "Who is Ross Perot?" 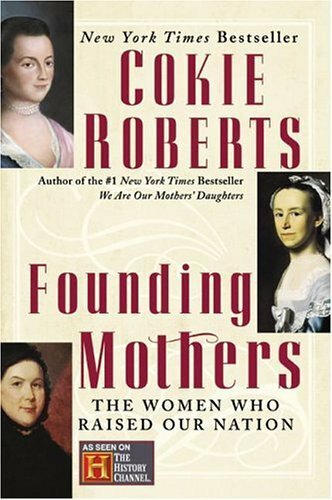 Cokie's books include We Are Our Mother's Daughters (1998), Founding Mothers: The Women Who Raised Our Nation (2004), Ladies of Liberty: The Women Who Shaped Our Nation (2008), with Steven Roberts, From This Day Forward (2000), also with Steven Roberts, Our Haggadah: Uniting Traditions for Interfaith Families (2011), and children's book Founding Mothers: Remembering the Ladies (2014).